Creating a speedometer ,largely depends whether you want to display a numerical readout, or as a rotating needle. First, to get the actual speed value, as mentioned in another answer, you can simply use the rigid body’s velocity. However, Unity’s default scale is one unit = one meter, so reading rigidbody.velocity.magnitude will give you the speed in meters per second. 1) Create a GUIText gameobject (from the gameobject menu). 3) Select your car, and drag a reference from the new GUIText GameObject in the hierarchy into this variable slot in car script, in the inspector. That should get you working with a numerical readout. To display as a rotating needle requires some trickier coordination. There’s no simple way to rotate a GUI Texture, or a texture drawn using the OnGUI method, so I’ve written a small general-purpose script which you can place on a gameobject to create a rotatable GUI Texture. You can control it by setting the ‘angle’ variable from other scripts. 3) Create a new empty GameObject. Name it “mph needle”. Add the RotatableGuiItem script to it. 4) Assign your speedo needle “Texture” variable. You probably want to use a texture with a transparent alpha background for this, and bear in mind that it will rotate around the centre of the image. Adjust the “size” values to match the size of your texture. 5) Adjust the position of the texture using the X and Y position values of the GameObject in the inspector, so that it is your desired position. (probably in the centre of a normal static GUI Texture showing the mph dial face). 7) Select your car, and drag a reference from the “mph needle” GameObject in the hierarchy into this variable slot in car script, in the inspector. Which means the needle will be rotated by 20 degrees when the mph is zero, and will rotate 1.4 degrees for every 1 mph. Hopefully this should get you to the stage where you have a working speedometer with a rotating needle! Please comment, I have worked hours solving this, if you comment, it will give me some support! ThemeResource.xaml contains the basic Color, SolidColorBrush and TextBlock resources. 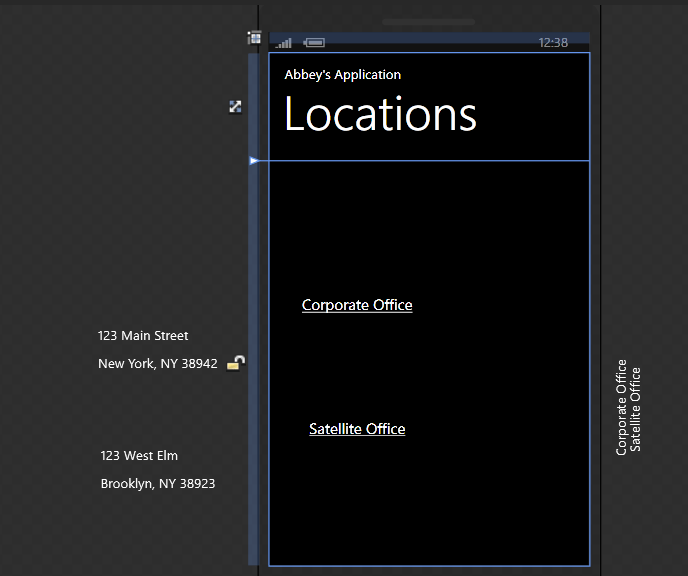 You can copy/paste this file in your application and reference it in the App.xaml to override specific styles. System.Windows.xaml has the styles for controls like Button, CheckBox, etc. Again you can use it to override the look and feel of the widgets. Finally, there is one folder for each of the 10 “accent” colors (blue is the default) for both the light and dark themes (the operator can provide a 11th color). And now the look and feel of your application is customized. One important notice: even though if you can override all the controls’ styles you should keep an eye on the implicit contract imposed by the platform i.e. the “Metro” UI guidelines. For example, it’s probably a bad idea to change the appearance of the default Button because your users will look after a particular widget in the page to save, confirm, send, etc. Please Feelo Free To contact me and please do comment, I need them for sure. This is very basic level small user control, in which we can discuss how to create web user control. I have given name to this file as “uploader.ascx” and kept this file under “userControl” for simplicity purpose. If file not exists or content length 0. Which says that this control is register to this page with specified source. To upload any of the file in respective folder user need to have permission for writing to the folder so please follow the following steps to prevent from the error. This will set right permission to entire virtual directory, this way we can minimize error from the front end for permission / access denied. Start by creating a C# Windows Application project in Visual Studio and on the form drag 3 labels, 2 textboxes, 2 buttons and one progressbar. As you can see in the form above, the first two labels are just for describing the role of the first two textboxes which are named txtUrl and txtPath. They will obviously hold the URL of the file we want to download and the local path (and filename) to where we want to save it. The default values I set in the project will download a short video from Microsoft’s Channel 9 website to C:\Filename.wmv. 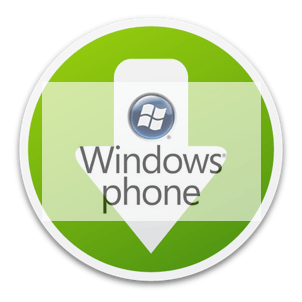 The two buttons – btnDownload and btnStop – are used for starting and stopping a download, while the label below them – lblProgress – is used for showing the current progress of the download in bytes and percentage. Finally, the ProgressBar located at the bottom of the form is entitled prgDownload and it display the progress of the download on a scale from 1 to 100. System.Net will be used for connecting to the web server, System.IO will be used for saving the file to the hard drive, and System.Threading will be used for the thread in which we’re going to put the downloading process. As you can see, we are creating a few objects that we’re going to use later in the code. The object that stands out the most is not really an object, but a delegate: UpdateProgressCallback – this delegate will be used to call a method you’ll see later in our code – UpdateProgress – from inside the thread. Because you see, from inside a thread we can’t update the form elements directly (the label and the progress bar), so we need to create a delegate first, that takes the same arguments as the method. In our case the arguments are two Int64 variables that hold the number of bytes we downloaded from the server by now, and the number of total bytes the file has. Int64 is needed because this number can be really big. The first line inside the method mentions that inside this method we’ll be using the wcDownload object, which can be disposed after we’re finished. If any error happens within the code, we have a finally block which closes the streams to prevent keeping a connection opened uselessly and to prevent the local file from being locked by the code. Inside the try block we first retrieve information about the file using HttpWebRequest and HttpWebResponse objects. Note that some servers don’t give information about the size of the file, case in which we can only download blindly. If the web server did not return any information regarding the size of the file, webResponse.ContentLength will return -1. After we get the size of the file, we define the stream that retrieves the bytes from the server, and the stream that saves the file to the hard drive. Before starting to stream the bytes down the cables, we create a buffer where we store the data that is written to the hard drive file. The buffer is 2048 bytes in size, but you can change it to a different value if you prefer. In the while loop we loop through the buffer and write the content of the buffer to the file on the local drive. We also use the Invoke method of the form to call UpdateProgressCallback (the delegate of UpdateProgress). In the array we pass two parameters that UpdateProgress accepts: how much we downloaded until now (by measuring the length of the local stream), and how big the total file is. If you don’t have any knowledge of threading in C#, you probably would have guessed that you can update the form elements (labels, progress bars, etc.) directly, but for good enough reasons you can’t. We do a simple math calculation to get the percentage (0 to 100) and we set it on the ProgressBar to reflect the progress. We also set the label with information on the progress of the download. In the code above we start a new thread, to which we pass the name of the method (without the parenthesis). Then we start the thread. The reason we need to use a thread and we can’t just call the method from inside the Click event is because in that case our application would completely hang while downloading the file. It would become unusable and unresponsive, as if it crashed. To make this a real download manager, we’d have to add resume options, and a download list so that we give the user the option to download multiple files at once, or schedule them. This will be covered in a future tutorial. Below is the entire source code of Form1.csthat you can also view in the Visual Studio 2005 project files attached to this tutorial. Please Do comment ,if you liked my tutorial. 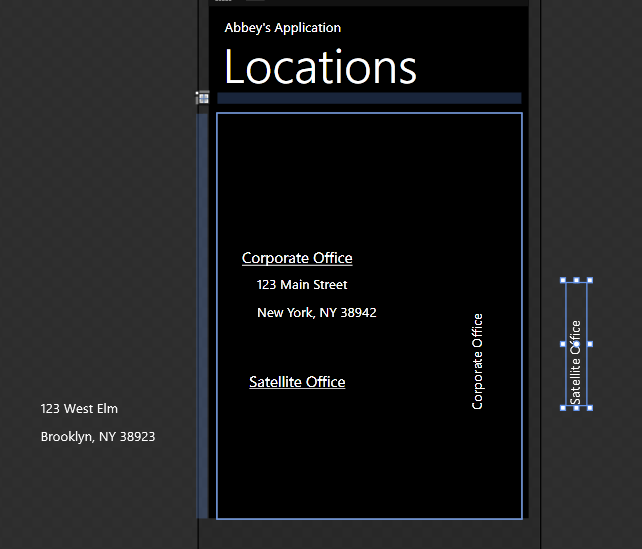 Alright guys i am back with a new concept in Windows Phone 7 ( WP7 ) which is ViewStateManager. It is a really important concept for understanding visual states associated with them. 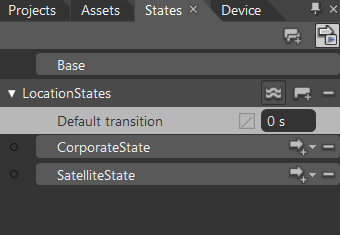 If you want to create different states for your custom control then we would have to use Visual State Manager. If you have the solution from my previous post then you can continue with it or you can download the solution here. We will a few custom states and also learn about behaviours in this post. 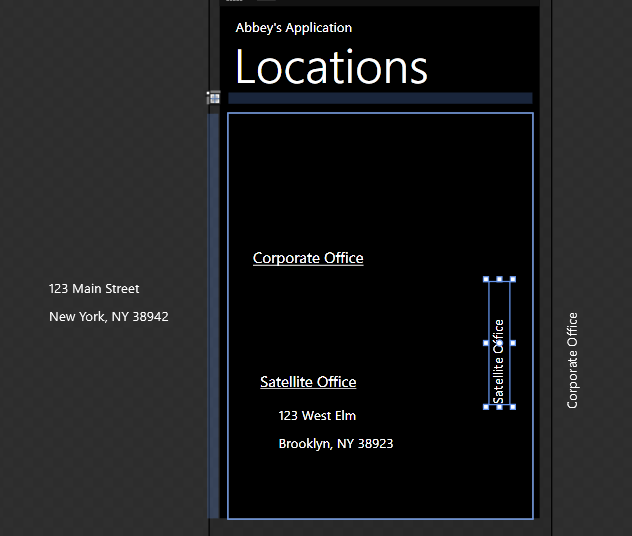 Now open CompanyLocations.xaml in expression blend. Drag four TextBlock controls onto the design surface, two for the headers and two for the details and then lay them out similar to the following snapshot. Lets add a little more fun to this. Add two more textblock rotated at 90 degree and move the location details of the screen and also increase the font size of the headings as in the image below. Now lets switch back to the initial state and that any changes we make will affect all the states. Now lets include behavior to bind these states to action. 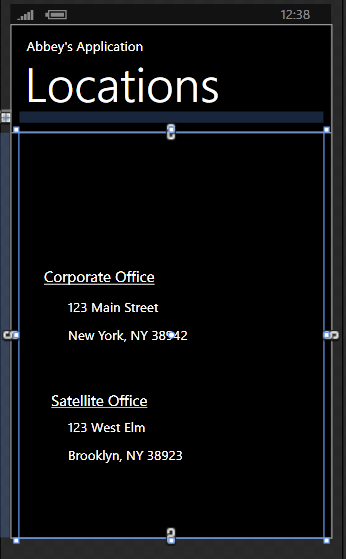 So now in your assets window search for GoToStateAction and drag and drop it to both the CorporateOffice and SatelliteOffice text. 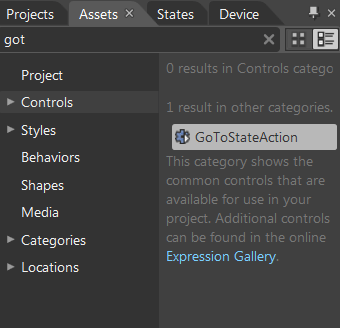 Now change the name to the GoToStateAction to the appropriate statename.